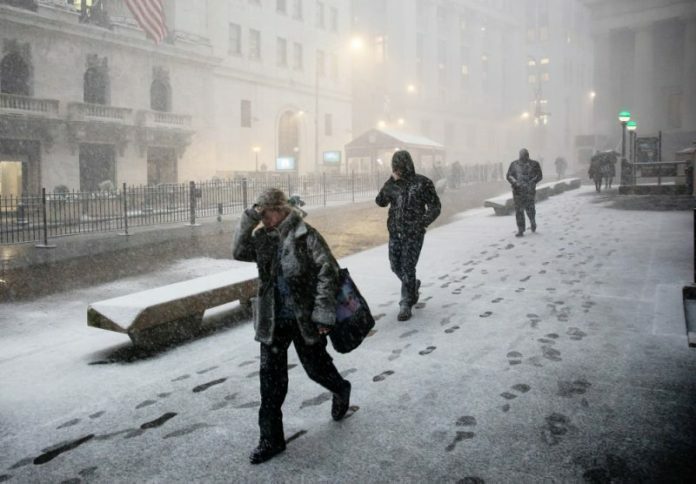 Officials are warning New York and New Jersey residents to be prepared for a storm expected to bring sleet, freezing rain and snowfall totals ranging from a few inches downstate to up to 2 feet in northern areas of New York. A state of emergency has been declared in New Jersey. Parts of the state could see up to eight inches of snow, Gov. Phil Murphy said. The winter storm will move into region late Monday night into Tuesday bringing snow across the region before it changes over sleet and rain. NJ Gov. Murphy declares state of emergency ahead of winter storm. Around 2 to 4 inches of snow is expected across the city and lesser amounts are forecast across coastal sections. Inland areas across Northern New Jersey and the Hudson Valley could get 4-7 inches as the changeover will take longer. Snow will develop by daybreak on Tuesday morning, making it a treacherous commute with visibilities less than a half mile at times, and snow- and ice-covered roadways will make for slick roadways. Snow and ice accumulation could also cause power lines and tree branches to fall. Gov. Andrew Cuomo said Monday that the storm is expected to hit western areas of the state Tuesday morning and make its way east, with slippery roads and blowing snow likely for the Tuesday evening and Wednesday morning commutes. Cuomo says forecasts call for as much as 2 feet of snow in the Tug Hill Plateau area off Lake Ontario’s eastern end. New York City Mayor Bill de Blasio, in Albany Monday for a state budget hearing, said conditions downstate could be “nasty” Tuesday. Sorry kids, NYC schools to remain open Tuesday despite snow forecast City sanitation officials say the worst the five boroughs might see is 6 inches of snow, but they’re prepared to handle up to a foot of accumulation. Eventually the snow will start to changeover to sleet during the midday hours Tuesday before finally totally switching over to plain rain during the afternoon. Heavy rain of an inch to 2 inches is expected Tuesday afternoon into the evening, according to the weather service. There could still be a few leftover showers Wednesday morning, but skies will clear out after as temperatures climb into the mid 40s.